Joanna - Now you're just being mean! Spring is arriving here, too and guess what we're getting instead of daffodils? That's right, SNOW! AGAIN! Then, if we're lucky, it will turn to rain and we'll have wonderful Spring SLUSH!! Nothing lovelier. Can't wait! BTW this is typical March weather in NY. "In like a lion and out like a lamb" doesn't half describe it. More like "One day a lion, next day a lamb, every day a surprise." Enjoy the sunshine and flowers for us! Sorry Lizzy .....sorry about your snow. for ages due to health problems. But I'm getting there slowly. Joanna wrote: Sorry Lizzy .....sorry about your snow. Sorry to hear you're not feeling your best. No one would ever know because you always have such a sunny disposition Joanna. Whatever you are dealing with I hope you will be back to feeling good again sooner than later. Tomorrow is officially the first day of Spring so HAPPY SPRING JOANNA! Joanna - Amen to everything Donnamarie said. I can't tell you how many times you've made me laugh and brightened my day. I hope you're well enough soon to get out and really enjoy the Spring weather and doing all the things you want to do. Joanna wrote: Happy news....Spring is arriving here in UK. on trees and bushes and a few sunny days. Yea right. We're supposed to get snow on Friday. I'm the cloud on your sunny day Joanna. Just kidding. I know spring is coming just not fast enough for me. We're getting snow too. Oh happy day. But hope springs eternal ( no pun intended). Off to buy some daffodils ( my fav). Enjoy everyone. Coming here every day has kept me sane, honestly. just a b*** y thing that's taking ages to get healed. the pond to you all. I know Katie and Nicky will want this moved to chit chat….but I implore you, don’t for the next 20 hours…. Today we have a new moon….a very special New Moon….This is your chance to write an Abundance Cheque/Check…Google Abundance Cheque to down load a blank Cheque….and a link as to how they work….They work on any New Moon….but this is a special one so mega powerful…. You have a 24 hour period to write it…so no pressure. Everyone thinks this is for money….and it is…. also for so much more than that….ask for an abundance of health…..In my case, last time, I asked for an abundance of joy in my family…and got it!…This time I am asking for an abundance of joy all around me….My BFF is asking for an abundance of recognition in her job…..see you can ask for anything not just cash….Catch is you seriously have to believe you have it, and are immensely grateful for it. Well I've been writing chqs all day for my job!!! so let the good times roll!!!!! Can't I hug a panda instead? He is smiling in his sleep . The panda is beautiful but I'd be too scared to go too close as it is bigger and stronger than I am. I'll just admire it from a distance. I am a wuss. Burn Before Reading will be on ITV at 10.45pm tonight in the UK. I'm planning to watch it as I really like it. love the scene in his bedroom ! conservatory and it looks much better ! .......no dust on sofa either ! What do you have in mind???? If you have an extra male-single-gorgeous-rich and able to breathe without a respirator or oxygen mask.. I'll be on the next flight across the pond. Oh no PP.....he's not in the freebie stuff pile. ps/what's a conservatory ( by UK definition)? This is what one looks like here . Rich people have them. This poor schmuck doesn't! maybe burn before reading is a knock off film and not really one with George in it. maybe a look-alike. Haa ha ha! Silly me, I don't know why I would write Burn Before Reading. It doesn't make any sense at all. I haven't even been drinking. I always thought this was Brad Pitt's best film (I know it's not really) but it's my fav role for him. He absolutely cracks me up as Chad. Joanna, you dark girl. You really like the bedroom scene when George kills Brad?! The look on Brad's face right before George shoots him is priceless. Hebe, if you haven't been drinking maybe you should start. Sometimes it clears the mind. Hahaha! Cheers and enjoy the movie. Donnamarie wrote: I always thought this was Brad Pitt's best film (I know it's not really) but it's my fav role for him. He absolutely cracks me up as Chad. ps/what's a conservatory ( by UK definition)? This is what one looks like here . Rich peoplehave them. This poor schmuck doesn't! to keep it cooler as we're South facing and get a lot of sun. No......I'm not rich.....It was already here when we bought the house. All UK houses are brick built. Yes Donnamarie.....I think his grin is priceless. Anybody have a March Madness bracket they want to discuss? No? Mine still looks pretty good. The trick is to pick the first-round upsets, then go better than even on the closely-seeded matchups in the second round. And let me just say that yeah, the weather has been sucky, but sports-wise, you can't beat this time of year. College basketball at its best and baseball spring training in full swing. Just when you get over the excitement of the Final Four and the NCAA Men's title game, here comes Opening Day in Major League Baseball. LornaDoone wrote: maybe burn before reading is a knock off film and not really one with George in it. maybe a look-alike. PARIS — A German jetliner on a routine flight to Düsseldorf from Barcelona, Spain, rapidly lost altitude for more than eight minutes and then crashed in the French Alps on Tuesday morning with 144 passengers and six crew members onboard, the airline said. Prime Minister Manuel Valls of France said that no one on the plane had survived the crash. Search and rescue teams scrambled in the afternoon to get to the site, in a remote and rugged part of the Alpes de Haute-Provence region of southeastern France that President François Hollande said at a news conference would be very difficult to reach. The French Interior Ministry said that more than 400 police officers and rescue personnel had been dispatched to the area. In the early evening, the French interior minister, Bernard Cazeneuve, reported that the plane’s cockpit voice recorder, one of the plane’s two “black boxes,” had been found. The device records up to two hours of the pilots’ conversations as well as other sounds, including any alarms that may have sounded during the flight. A French official with direct knowledge of the investigation said searchers were still looking for the other black box, the flight data recorder, which keeps track of roughly 1,300 different statistics about the aircraft’s operational performance. The aircraft, an Airbus A320, operated by Germanwings, a budget subsidiary of Lufthansa, took off at 10:01 a.m. The jet, Flight 9525, climbed normally to its cruising altitude of 38,000 feet but remained there for only a few minutes before beginning to descend at a high rate, the managing director of Germanwings, Thomas Winkelmann, told reporters. When French air traffic controllers lost contact with the aircraft at about 10:53, it was flying at just 6,000 feet, Mr. Winkelmann said, and it crashed shortly afterward. Witnesses in the area of the crash site said that the terrain there rose to an elevation of more than 6,000 feet. Wreckage was located by a French military helicopter near the town of Prads-Haute-Bléone, according to Éric Héraud, a spokesman in Paris for the aviation authority, the Direction Générale de l’Aviation Civile. Aviation safety experts said that a steady descent of more than eight minutes, while highly unusual, may not be consistent with a sudden midair upset, such as an aerodynamic stall. In such cases, they said, they would expect a plane to fall from cruising altitude to the ground in half that time or less. “While investigators still need to verify the data are correct, eight minutes is definitely longer, compared with the experience we have had in past cases,” said Olivier Ferrante, a former crash investigator for the French government who now advises the European Commission in Brussels. He cited the Air France flight that crashed over the Atlantic Ocean in 2009, which fell to sea level from 38,000 feet in three and a half minutes. Flight path data from Flightradar24; satellite image by Earthstar Geographics via Bing Maps. The early images of wreckage, showing debris in small pieces, suggested the plane had probably struck the ground at very high speed, Mr. Ferrante said, but he cautioned that it was far too early to speculate why. Mr. Valls, the prime minister, told the French National Assembly on Tuesday that no hypothesis about the cause of the crash could yet be excluded, and that a judicial investigation had been opened. He expressed his solidarity with the families of the victims and said that France would do everything possible to support them. Frédéric Atger, a spokesman for Météo France, which monitors weather across the country, said that the conditions had been “particularly calm” in the area at the time of the crash. Conditions were expected to worsen later in the afternoon and evening, however, with temperatures below freezing overnight, complicating search efforts, the French Interior Ministry said in a statement. Mr. Hollande said that many of the people on board were German, and that none were believed to be French. King Felipe VI of Spain, who had just arrived in Paris for a state visit when the crash was reported, said that Spanish and Turkish citizens had also been on the flight, and Reuters reported that there was one Belgian. 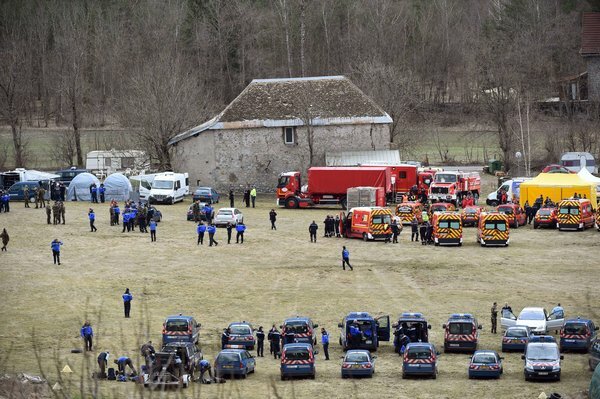 Bruno Lambert, a mountain guide who lives in Chanolles, a hamlet in the Prads-Haute-Bléone municipality, said the area of the crash was sparsely populated with steep mountain terrain. A local official in the region, speaking on the condition of anonymity because he was not authorized to comment publicly, said that an initial survey of the area by a helicopter showed that debris had been spread across a very craggy area. A local newspaper posted photos online that it said showed wreckage from the crash. Officials in Haltern am See, a small city near Dortmund in northwestern Germany, said that 16 10th-grade students and two teachers from a local high school, the Joseph-Königs Gymnasium, were aboard the plane. They were returning from an annual exchange with students from the Institut Giola in Llinars del Vallès, near Barcelona, the school wrote on its home page. “This is the darkest day in the history of our city,” said Bodo Klimpel, the mayor. He said the school closed and sent students home when the news of the crash was confirmed. He said the school would reopen on Wednesday, but instead of holding regular classes, students and teachers would gather in the auditorium to begin working through their grief. “You can imagine that tomorrow will also be a difficult day,” Mr. Klimpel told reporters. Hans-Josef Böing, an administrator for the city, said in a telephone interview that many parents had gone to the Düsseldorf airport to meet their children, and that psychiatrists were there to assist them. The type of aircraft that crashed, an Airbus A320 single-aisle jet, is a workhorse of many airline fleets, with more than 5,600 in service around the world. More than one billion passenger trips were flown on jets in the A320 series — which includes a smaller version, the A319, and a stretched model, the A321 — according to estimates by Ascend, a London-based aviation consultancy. The aircraft’s safety record has been very good, but not completely spotless. Since entering into service in 1988, A320 aircraft have been involved in 12 fatal accidents, according to Ascend. In Germany, Ms. Merkel expressed her deep sympathy for the families of the victims, saying that the crash was a “terrible shock” and that there would be a thorough investigation. Ms. Merkel said she would fly to southern France on Wednesday to meet with the authorities there. Prime Minister Mariano Rajoy of Spain said he had spoken with Ms. Merkel and with the Spanish king, who cut short his visit to Paris to return to Madrid. “We are all deeply moved and will do everything we can to help the families of the victims,” Mr. Rajoy said. Germanwings, based in Cologne, was founded in 2002 and acquired by Lufthansa in 2009. It has since grown to become Lufthansa’s main operator for domestic and short-haul European flights from cities other than the main hubs of Munich and Frankfurt. It has a fleet of around 81 planes, of which about two-thirds are Airbus A320s and A319s. French news reports said that the crash on Tuesday ranks as the third deadliest in the country’s history. In December 1981, a chartered Yugoslav DC-9 jetliner smashed into a mountain in Corsica minutes before it was due to land at Ajaccio Airport, killing all 180 people on board. In 1974, a Turkish Airlines DC-10 crashed outside Paris, killing more than 335 people. Such sad news Nicky. Don't know what else to say. Always devastating when planes crash. Made even worse by the fact there were students on the plane returning from an exchange program. I was watching cable news early this morning as I usually do and they broke this story within an hour of it happening and covered it the whole morning here. This is a terrible tragedy and my heart goes out to all the families, friends and classmates of those on he plane. My thoughts also go to the emergency services who are doing such difficult jobs. Yes the emergency Service is great. You can't reach this part by car only by Foot as it is high up at the mountain. It is already dark there. Will be a long night for them. There were two Babys on board. It's going to be a very hard job to reach the area where the plane crashed. Our 6 o'clock news said one black box had been found. Helicopters going in I expect. They have a terrible job to do. I do admire them. kool-aid at the wedding" ? Well JOANNA drinking the kool-aid means to accept a philosophy, argument or belief blindly without question. LizzyNY will have to explain what she means as it pertains to Amal. Jo- Sorry about that. The expression originated when the cult leader, Rev. Jim Jones, told his followers to commit suicide. Because they believed everything he said they did so by drinking poisoned kool-aid. So, since then "drinking the kool-aid" has meant being totally convinced about something. In Amal's case, I think she has come to believe she is a fashion icon and must keep up the image - aided and abetted by people like Anna Wintour and the designers who want to dress her, and maybe even George and his publicity people. Latest News about the German plane crash Today. auto Pilot to descend rapidly into the mountain. inside and have been following 9/11. This is extremely shocking news and is based on what was heard from the recovered black box. Thanks Lizzy for the Kool-Aid response. I well remember the mass suicides of course. disrespective to use a praise like that IMO. I've moved the 'kool aid' posts to this thread because they've got absolutely nothing to do with George Clooney being in New York and are clearly going to be contentious. And to answer the question, no it's not disrespectful. It's simply an expression that's come to mean people who are willing to blindly follow a thing/person without question. Katie, thanks for clearing things up for posters outside the US who could misunderstand how that expression is used. I'm sure it was considered offensive when it first surfaced, but that was a long time ago. Most people don't even remember the event that led to it. Now it's just something people say to illustrate a point. Joanna - I guess we in the US can seem a little insensitive at times, but our hearts are in the right place. Sorry if I upset you. And to answer your question, no we don't have a slang expression for the events of 9/11. Much too recent and universal. Give it another generation or two and I'm sure someone will come up with something obnoxious. It's the nature of the beast. emotional sometimes due to the pills Im taking. Don't want to cause a rift. Honest. Haven't been giving the site due attention lately... but have noticed not much from melbert. Is she okay?? Joanna - You absolutely didn't upset me - honest. I know sometimes expressions/intentions don't travel well across the pond and I wasn't sure I hadn't offended YOU, which was never my intention. I'm sure if we ever did have a problem we could work it out. Hope you're feeling better and able to get out a bit. That always brings my spirits up and makes me feel better. O'Donnell..."Are we good" answer "Yes, we're good"
Joanna - Baby steps, Sweetie, baby steps! You'll get there! I'm here every day. Just don't feel the need to enter into some of the banter that would set me off. So, I'll stay silent on the topics that rile me.